Candidates who had applied for the Postal Assistant/ Sorting Assistant, Postman and MTS posts, they need to check the details of Bihar Postal Circle Recruitment 2019. Candidates who are interested to work in Bihar, they can get complete information on Bihar Postal Circle Notification 2019. 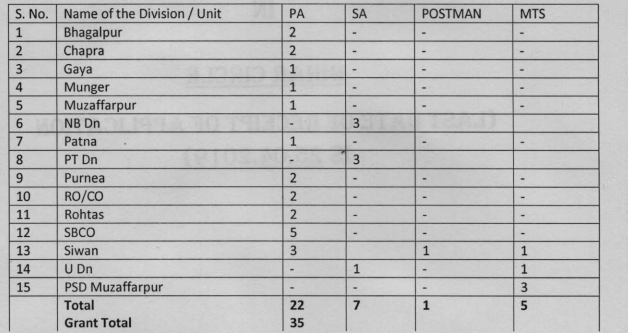 To fill the 35 vacancies, the officials released this Bihar Postal Circle Advertisement 2019. Excited applicants can apply for indiapost.gov.in Jobs 2019 on or before 25th April 2019. In the below sections, we had given the complete details such as educational qualifications, selection process, salary details, set of instructions to apply for Bihar Postal Circle Recruitment 2019, and others. Candidates have to check the age limit details before applying for the Bihar Postal Circle Recruitment 2019. The higher authorities of Bihar Postal Circle will specify the Selection Process For Bihar Postal Circle Vacancies 2019 for the Postal Assistant/ Sorting Assistant, Postman and MTS Posts. Every applied candidate have to attend this selection process. If any of applicant had not attended the selection process, you will not be the part of Bihar Postal Circle Organization. Rs.25500 in Level 4 as per Pay Matrix specified in Part A of Schedule of Central Civil Service (Revised Pay) Rules 2016. [Rs.5,200-20,200 (Pay Band-I) + Grade pay of 2400 plus admissible allowances (as per Pre-revised scale. Rs.21700 in Level 3 as per Pay Matrix specified in Part A of Schedule of Central Civil Service (Revised Pay) Rules 2016. Probation: Candidates selected will be appointed and will be on probation as per rules. Training: Training will be imparted to selected candidates as prescribed. Candidates have to visit the official site of Bihar Postal Circle that is indiapost.gov.in. Go to the Opportunities section which is at the end of the home page. In that search for the blue blinking link of Bihar Postal Circle Recruitment 2019. Read the details in the Bihar Postal Circle Recruitment 2019 Notification, and download it. If you are eligible, then download the Bihar Postal Circle Recruitment 2019 application form in the given proforma. Fill the details in the Bihar Postal Circle Recruitment 2019 application form in your own handwriting. 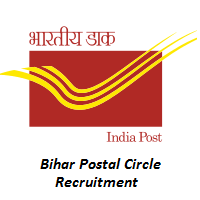 Send the Bihar Postal Circle Recruitment 2019 application form to the following address via speed post or registered post. Candidates can visit our site Sarkari Recruitment for more updates on Bihar Postal Circle Recruitment 2019. You can also share this information with your friends also. From our site, you will get more stuff on bank jobs, railway jobs, latest recruitment notifications of state and central government jobs, and others. If any of aspirants are having doubts, they can comment us in the below section.